I have to type quickly. If I don’t get this recipe post up today, *SOMEONE* will be very upset with me. Yes Farmer Becky, I’m looking right at you. Farmer Becky is currently out on a mission with The Big Guy to hunt down a food processor. She’s wanted one for years, but just never made it a priority. Until last night, that is. At 6:54 pm yesterday it was “one day”. By 7:03 pm it had turned into a full-blown Code Red Emergency. What caused this monumental shift in perspective, I hear you cry? Yes, that humble, white, floret-filled Brassica. One of the vegetables that Farmer Becky hates. Except suddenly, she doesn’t. Suddenly she loves cauliflower to the point of giving up her weekend to go in search of the perfect food processor. So she can make large bowls full of this. Yes. It looks like rice. It also tastes like rice, feels like rice and fills you up like rice. In fact, if you had your eyes closed you would totally believe that you were eating rice. This was my big experiment of the week. And I had no clue what I was doing. No clue. But in my mind I had a dream of what it could be, and then I just played with it. I was so excited when I’d finished making it, I stood in the kitchen and clapped like a seal. Farmer Becky can verify. She pointed and laughed. I didn’t care. Not only had it worked, it tasted fabulous. Just how I had imagined. At that stage Farmer Becky had no idea what it was. She just knew it looked really good. I think she secretly hoped that somehow it would be rice. Except she knew that *SANE™ people don’t eat rice. It was The Big Guy who finally figured out what it was, and I think that may have been because they were running out of possibilities for white stuff that was a food. Farmer Becky was incredulous when the secret was revealed. Because, you know, she hates cauliflower. Except now she loves cauliflower. And that’s awesome. I am totally in love with this salad. I want to eat it every day for the next week. I think I will. 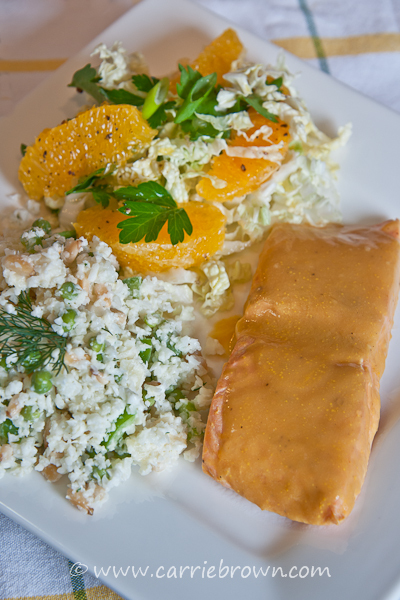 On the plate with it was Glazed Salmon and Orange Herb Slaw. The colors all complemented each other so well you’d think I’d planned it that way. This meal was like summer on a plate. This is the biggest success of The Friday Night Dinners to date. Because who knew you could eat bowls full of “rice” salad and get skinny? Well now, you can. Hip Hip Hoorah! In small batches, pulse the cauliflower florets in a food processor until it resembles rice (about 10 pulses). Do not over process! Melt the coconut oil in a skillet and turn the heat to medium low. Put the cauliflower “rice” into the skillet, cover and cook for 8 minutes, stirring every 2 – 3 minutes. When the cauliflower is just tender, but not soft, remove from the heat and leave to cool completely. To cool faster, spread it gently onto a baking sheet. 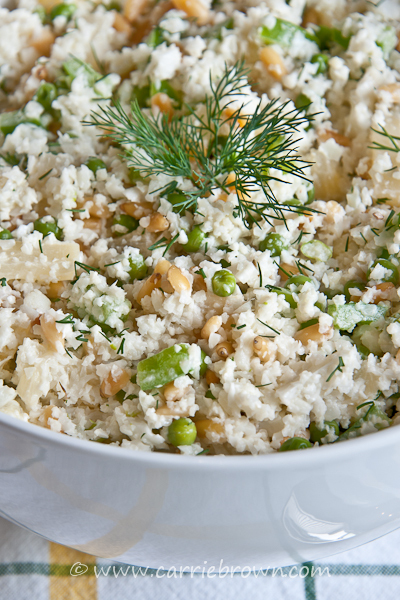 Put the green pepper, peas, pineapple, pine nuts, dill, mayonnaise and salt in a large mixing bowl and mix together well. Carefully stir in the cauliflower “rice”. Do not over stir as the cauliflower may get mushy. 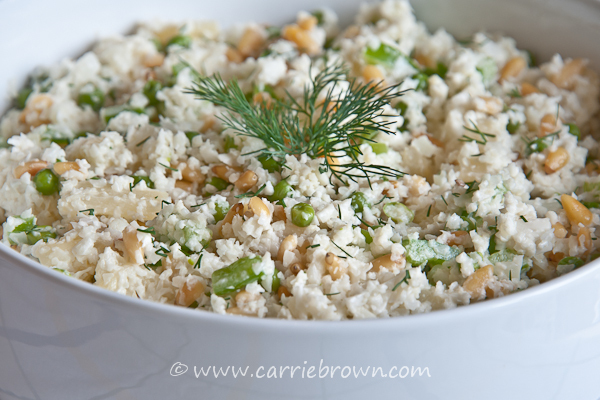 Turn into a serving bowl and sprinkle with a little chopped dill plus a sprig for garnish. *SANE™ – a term used in Jonathan Bailor’s book, The Smarter Science of Slim.